The OSC (Ontario Securities Commission) has initiated an investigation into QuadrigaCX, the major Canadian cryptocurrency exchange that recently filed for creditor protection due to a lack of funds. The OSC stated that due to the fact that there was potential harm being caused to Ontario’s investors, the agency had now opened a probe into the exchange’s dealings. The agency stated that it had already gotten in touch with the monitor. This probe comes immediately after the BCSC (British Columbia Securities Commission) announced that it did not regulated QuadrigaCX since the exchange not shown any signs of trading in securities or derivates. Read more about this story here. Robert J Jackson, Jr., a commissioner of the US SEC (Securities and Exchange Commission) said that he believed that applications for BTC ETFs (Bitcoin exchange traded funds) would eventually be approved. He said that in the end one of the applicants would meet the standards that the agency had laid out. Currently, there are a number of applications for BTC ETFs at the SEC that have not been approved. However, the Chairman of the SEC Jay Clayton says that crypto-based ETFs cannot be approved until concerns are addressed with regard to market manipulation. The not-for-profit organization Pistoia Alliance issued a press release in which it stated that it was expanding its Blockchain project so that it would include data identity, data sharing as well as data integrity. The Pistoia Alliance was established in 2007 and consists of representatives from pharma industry majors such as Pfizer, GSK and Novartis. This alliance had been formed to assist in the integration of new technologies to help in these companies’ R&D (research and development) initiatives. This new project is focused on Blockchain use in validating sources in data identification, ensuring data integrity and improving sharing between different organizations. 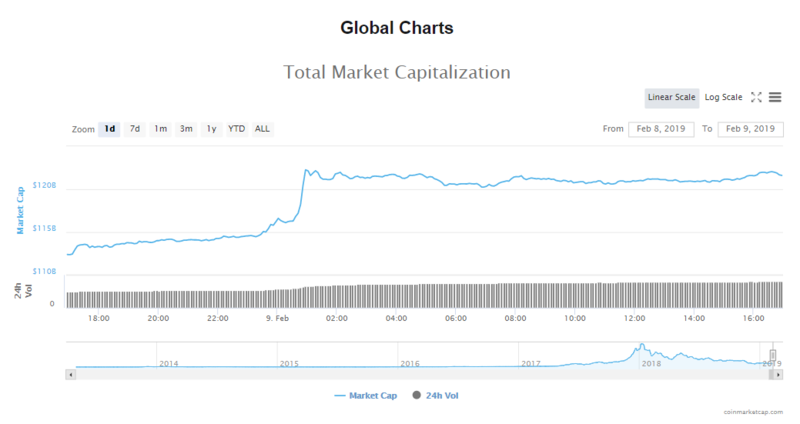 Trading volumes in the cryptocurrency market have surged in the last 24 hours to $25.34 billion and the value of the market has shot up to $121.70 billion. Bitcoin’s price has surged by 7.43% to $3673.19 in the last 24 hours. 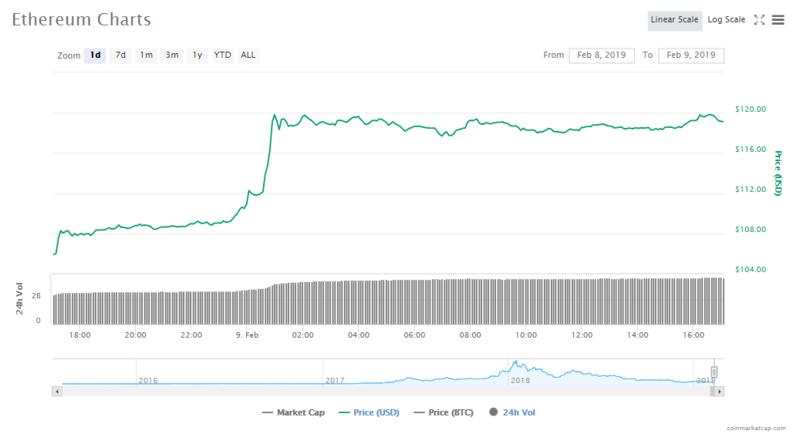 The market value of the number one crypto has jumped up to $64.38 billion and trading volumes are surging at $7.95 billion. Ether has also surged by a massive 11.72% in the last one day to trade at $119.07 per token. The world’s number two altcoin’s value in the market is now at $12.47 billion and trade volumes are at $3.66 billion. The cryptocurrency market has done an about face in the last 24 hours after lackluster trading for so long. The biggest gains have been for Litecoin, whose token price has skyrocketed by 25.60%. Ether is up by 11.72% and Binance Coin is the third biggest gainer with a 10.39% jump. Bitcoin’s token price is $3673.19, surging 7.43%. Bitcoin’s valuation in the crypto market is now $64.38 billion. 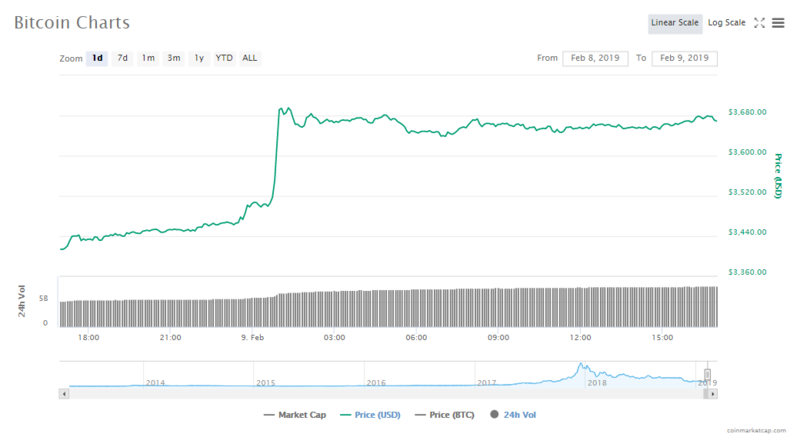 Ripple’s token price is $0.310586, surging 5.82%. Ripple valuation in the crypto market is now $12.78 billion. Ethereum’s token price is $119.07, surging 11.72%. Ethereum’s valuation in the crypto market is now $12.47 billion. Litecoin’s token price is $44.75, surging 25.60%. Litecoin’s valuation in the crypto market is now $2.70 billion. EOS’s token price is $2.74, surging 14.95%. EOS’ valuation in the crypto market is now $2.48 billion. Bitcoin Cash’s token price is $128.91, surging 10.18%. Bitcoin Cash’s valuation in the crypto market is now $2.27 billion. Tether’s token price is $1.00, rising 0.30%. Tether’s valuation in the crypto market is now $2.02 billion. TRON’s token price is $0.027249, rising 5.42%. Tron’s valuation in the crypto market is now $1.81 billion. Stellar’s token price is $0.081135, surging 7.70%. Stellar’s valuation in the crypto market is now $1.55 billion. Binance Coin’s token price is $8.93, surging 10.39%. Binance Coin’s valuation in the crypto market is now $1.26 billion. The Japanese Police is now probing a crypto-jacking case involving the mining software, Coinhive, which is used to mine Monero. According to sources, the suspects set up websites which installed the mining software on visitor’s computers without their knowledge or consent. This is in direct violation of the law that bans the use of computer viruses. In the latest news, JP Morgan Chase & Co, the National Bank of Canada, Pfizer, Goldman Sachs Asset Management, as well as Legg Mason’s Western Asset among other major corporates tested the new Quorum Blockchain platform with the aim of making financial transactions easier. Binance announced that it has resumed its services after it had suspended them on July 3 after an alert was given to the exchange about irregular Syscoin (SYS) trading by multiple API users. Rather than take a chance, the cryptocurrency exchange suspended all trading, deposits and withdrawals. The exchange also took extra security measures to ensure that their customers’ funds were all safe. In a press release issued today, April 10, the US-based crypto exchange Bittrex has responded to the denial of its application for a BitLicense by the NYDFS (New York Department of Financial Services). Subscribe to receive the latest opinions and education articles. Let's stay updated!